Slaapkamer heeft een Super King size bed, twee nachtkastjes met verlichting, ingebouwde kasten, kaptafel en kruk, bamboe fauteuil, plafondventilator, airconditioning / verwarming en wandlampen. Eén op het zuiden gericht venster en een op het westen gericht venster - beide met horren en veiligheidssloten. Badkamer bestaat uit een douche, toilet en wastafel met spiegel en opbergruimte. Keuken / eetkamer - volledig ingerichte keuken met koelkast / vriezer, elektrisch fornuis met oven en kookplaten, magnetron, broodrooster, wasmachine, waterkoker, fruitpers, mixer, etc. Er is ontbijt bar met twee krukken, en een buiten roterende waslijn. Woonkamer - bevat een tweepersoonsslaapbank en een tweezitbank met bamboe bank, met een grote salontafel in bamboe en glas. Er is een ventilator aan het plafond, en een actieve open haard. De woonkamer is voorzien van dubbele beglazing openslaande deuren uit op een patio, die een tafel en 4 stoelen met uitzicht over de vallei naar de zee. Er is een TV met satelliet, DVD, CD stereo. (met geleverde films en CD's) en WiFi-internet. Externe gebied bestaat uit twee niveaus, het bovenste niveau heeft een 'stappen walk-in' zwembad van 15 meter lengte met 4. 5 meter breedte en een een niveau diepte van 1. 5 meter. Er zijn drie zithoeken beschikbaar, met voldoende zonwering in elk gebied. Het onderste gedeelte, waar de villa zich bevindt, heeft opnieuw drie zitplaatsen. De voorkant van de villa zitplaatsen heeft uitzicht op een vallei naar de zee bij Paphos, en er is ook een eethoek onder een zeer schaduwrijke Johannesbroodboom. De tuinen hebben een grote selectie van struiken, bloemen en fruitbomen. A lovely villa. Very clean and well equipped. The garden and pool are superb. Brian and Val were very welcoming and helpful. Tsada is only 15 mins from Paphos but being about 600m above sea level it is much cooler - no doubt a good thing in summer, but not in the unusually bad weather that we experienced in early April! We would love to return in the summer months. What a wonderful review from Sandra and Richard, they were an absolute pleasure to have as guests. If cleanliness was on a par with godliness, then they are Gods! We have never had our villa left so clean after departing guests. Val and I look forward to receiving them any time in the future. A little piece of tranquility in an ideal location. This little gem of a villa is like a home from home. Inside it’s very well maintained and has everything you need for a relaxing holiday. Then there is the outside space. The gardens are amazing and add to the peace and tranquility with little sun traps all around to catch the sun at all times of the day. The pool is large enough for avid swimmers and is perfect for cooling off in the heat of the day. 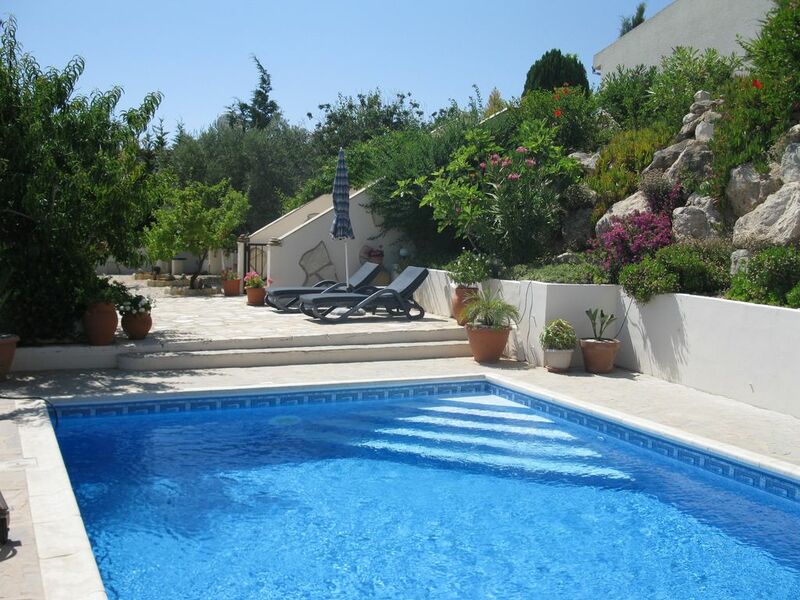 The villa is ideally situated for those wanting access to the mountains or those wanting the nightlife of Paphos. Brian and Val are excellent hosts and nothing is too much trouble. We will definitely be returning and thoroughly recommend it to other couples. Val and I would like to thank Steve and Fay for such a glowing critique, and we both look forward to them returning sometime in the future. My wife and I loved our stay. Brian and Val could not have been more helpful or accommodating, both in advance of our trip and while we were there. The villa itself is wonderful, tucked away on a hill in splendid gardens with breathtaking views over Paphos. The pool area was also huge, totally private and beautifully maintained. We’ll definitely be booking again! We have stayed in Val and Brian's lovely villa for a number of years (think it about 10 !) - and have experienced every season. The gardens are beautiful and so well kept. The swimming pool is great too. If you want a peaceful holiday away from the crowds in Paphos this is definitely for you. There are a couple of restaurants in Tsada and a very popular brewery quite near. In fact we walked back to the villa from it on one occasion. Val and Brian are always on hand to tell you places to visit and will sort out any problems you may have. The super king size bed is really comfortable and the bathroom well equipped. We enjoy sitting outside on the patio reading our books, doing sudoku or just looking at the lovely views down the valley. We have busy lives in the UK so it is so lovely to relax for a change!!! It is always a pleasure to welcome Jill and Barry back each and every year, They are such easy going visitors, and with so many visits, they are almost a part of our extended family. Val and I hopefully look forward to their visit next year. We had a very relaxing 10 days in the villa, the weather was kind and though they were not accustomed to visitors at this time of year Brain and Val made us very welcome. Heaters were duly supplied and were required at night but every morning we were able to enjoy breakfast on the terrace. The villa is very well equipped and Brian is on hand to provide help when required. The location is great for enjoying the peace and quiet, relatively easy to find with good instructions and well placed, far enough away from Pafos. We would consider visiting again. Many thanks to Mark and Carol for braving the Cyprus Winter! However, they were blessed with good weather during their stay, and gave us a new slant on catering for the cooler months. They were a pleasure to have as guests, and we look forward to seeing them sometime in the future. Golf: Een 10 minuten rijden brengt u naar Minthis Hills Golf Course in Tsada. Er zijn drie andere golfbanen binnen een 30 minuten rijden van Tsada, deze zijn Secret Valley, Aphrodite Hills en Elea.